The developer, S.J. Collins, unveiled sketch at a meeting on Sept. 19 and shared it with Decaturish. 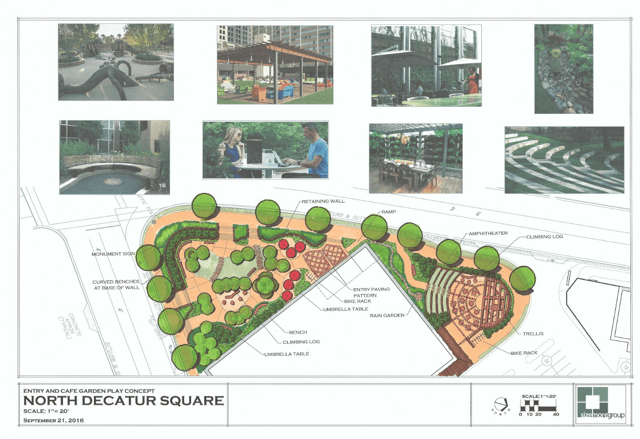 The space is being called a “Residential Park.” The current proposal includes an amphitheater and a bike rack. A spokesperson for the company said these designs are still in the process of being updated. “This is obviously not a ‘set-in-stone, never to be changed’ plan, but it is the general plan moving forward. They’ve taken what they’ve heard from the community and interpreted that through these [renderings],” she said. The DeKalb County Planning Commission recently approved zoning applications for the project, which will be located at North Decatur Road and Church Street. A special land use permit would allow for a bank with a drive-through. The developer has dropped a request for a restaurant with a catering drive through. North Decatur Square will also have 200 to 300 apartment units. A certain percentage of those units will be “workforce housing” geared to lower income residents – like teachers, police officers and firefighters – who might not otherwise be able to afford to live in the area. S.J. Collins did receive $1.8 million in tax breaks from the Decide DeKalb Development Authority to support the project. Most of the taxes abated will be property taxes, according to a fiscal impact analysis of the project. The shopping center is expected to be open by spring of 2018.